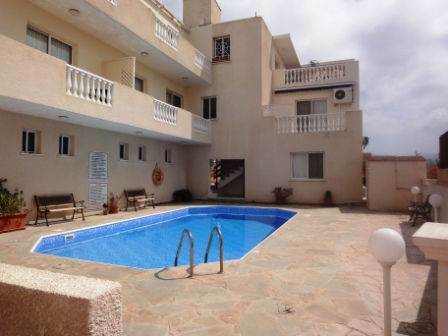 Peyia, Paphos - Situated in the traditional part of Peyia, within easy walking distance to the centre of the village, this two bedroom apartment with superb sea views offers great value for money. The accommodation features a spacious open plan living room with lounge, dining area and end kitchen, which is well equipped with a built-in oven, electric hob/extractor fan, fridge/freezer and washing machine. Patio doors from the lounge provide easy access to a covered balcony overlooking the swimming pool, and from here there are wonderful sea views. An archway in the living room leads to two double size bedrooms and a family bathroom. Both bedrooms have fitted wardrobes, and one also has patio doors opening on to the covered balcony with lovely views. The property is being offered fully furnished and has full title deeds. There is an allocated covered parking space and storage room. In summary, this is a great opportunity to own an apartment on a small and well managed project in an area that is very popular for holidays and residential living. Please refer to MLS#: 1296 when inquiring.